Chasm trap in data warehouses occurs when two fact tables relate into one dimension table. This is a data modelling problem which will cause double-counting and bad data when these tables are joined. SQL and relational databases surprise me every day! Star schemata in data warehouses usually have one fact table and many dimension tables where the fact table joins to it's dimensions tables via foreign keys. This is OK. But what if you wanted to 'share' the dimension across two or more fact tables, use it commonly, slowly starting to create an intertwined galaxy maybe! These multi-fact schemas are also called Fact-Constellations. For example think of a CUSTOMERS dimension table with the details of the customers and two fact tables SALES and REFUNDS with order and refund transactions as in the data model below. What happened? Do you see the duplicates? We joined by the n-1 principle. 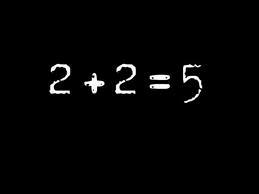 That is 3 tables 2 join statements on the keys. It seems is impossible to query these two fact tables via their common dimension. So why can't we know how many SALES and REFUNDS a customer did? Strange, why is the query falling into a Cartesian Product when you want to query from two different tables via a common dimension table? Hint: Think of data modeling. But before let's try to sort out the chasm trap. Or an alternative solution can be to study again the data model and look at superfluous or wrongly assumed data relationships and dependencies. Maybe the dimension table is not meant to be shared. Review of the data model and data warehouse design might be necessary. If you are going to use one dimension on two fact tables in your Data Warehouse, make sure you don't fall into the Chasm Trap. Or your data will be incorrect and untrustworthy. You must first pre-aggregate and then join to get correct results or look to better your understanding of the model and the relationships. For example maybe the REFUNDS entity is not directly related to CUSTOMERS but it is to SALES? Once a gain we see how important data modeling and the understanding of the problem the data is trying to solve is. Sometimes you need to ask this most simple question about your database to figure out what the real size of your data is. Databases store loads of auxiliary data such as indexes, aggregate tables, materialized views and other structures where the original data is repeated. Many times databases repeat the data in these structures for the sake of achieving better performance gains for the applications and reports they serve. The duplicate storage of data, in this case, is legitimate. It is there for a reason. But should this repetition be measured and included in the database 'data' size? Probably yes. After all, it is data, right? To make things worse, many databases due to many updates and deletes, over time create white space in their storage layer. This white space is unused fragmented free space which can not be re-used by new data entries. This is bad. Often it will end up being scanned in full table scan operations unnecessarily, eating up your computing resources. But the most unfortunate fact is that it will appear as if it is data in your database size measurements when it is not! It is just unused white space, nothing but costly void. Very bad. One should be diligent when measuring database sizes, be suspicious. There is loads of data which is repeated and some of it is just the blank void due to fragmentation and unused white-space. You will be surprised to see how much database white space exists in your database if you do not reclaim it back during maintenance. If you are curious to find out, there are ways you can measure the whitespace and the real data. So, how do we measure? Below is a database size measuring SQL script which can be used with Oracle to show data (excluding the indexes) in tables and partitions. It also tries to estimate real storage (in the actual_gb column) excluding the whitespace by multiplying the number of rows in a table with the average row size. Replace the '<YOURSCHEMA>' in the code with the schema you wish to measure. Provided you have statistics calculated before you measure. SQL with Apache Spark, easy! Reading about cluster computing developments like Apache Spark and SQL I decided to find out. What I was after was to see how easy is to write SQL in Spark-SQL. In this micro-post I will show you how easy is to SQL a JSON file. For my experiment I will use my chrome_history.json file which you can download from your chrome browser using the extension www.JSON-XLS.com. 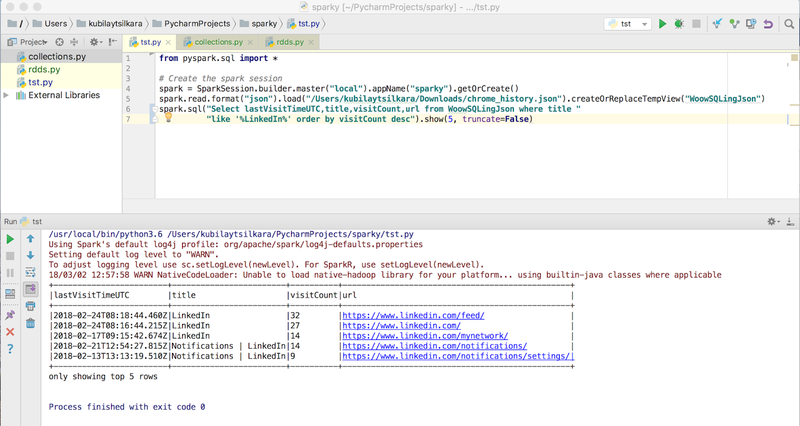 To run the SQL query on PySpark on my laptop I will use the PyCharm IDE. 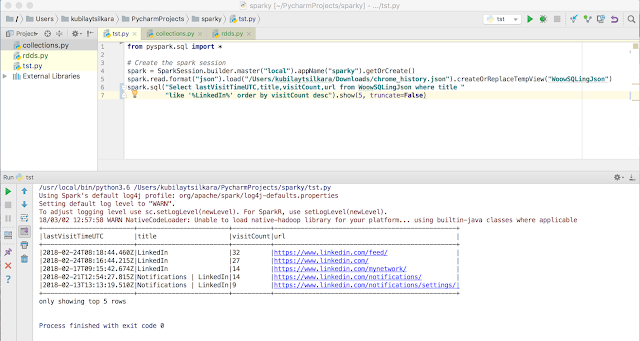 After little bit of configuration on PyCharm, setting up environments (SPARK_HOME), there it is: It only takes 3 lines to be able SQL query a JSON document in Spark-SQL. One should feel really sorry about anyone who will rely on filtering and making a decision based on bad, bad data. It is going to be a bad decision. This is serious stuff. I read the other day a recent study by IBM which shows that "Bad Data" costs US $3.1 trillion per year! OK, let's say you don't mind the money and have money to burn, how about the implications of using the bad data? As the article hints these could be misinformation, wrong calculations, bad products, weak decisions mind you these will be weak/wrong 'data' driven decisions. Opportunities can be lost here. So why all this badness, isn't it preventable? Can't we not do something about it? 1) Data Cleansing: This is a reactive solution where you clean, disambiguate, correct, change the bad data and put the right values in the database after you find the bad data. This is something you do when is too late and you have bad data already. Better late than never. A rather expensive and very time consuming solution. Nevermind the chance that you can still get it wrong. There are tools out there which you can buy and can help you do data cleansing. These tools will 'de-dupe' and correct the bad data up to a point. Of course data cleansing tools alone are not enough, you will still need those data engineers and data experts who know your data or who can study your data to guide you. Data cleansing is the damage control option. It is a solution hinted in the article as well. My 'modus operandi' is option 2, a Good Database Design and data engineering can save you money, a lot of money, don't rush into projects with neglecting or skipping database tasks, engage the data experts, software engineers with the business find out the requirements, talk about them, ask many questions and do data models. Reverse engineer everything in your database, have a look. Know your data! That's the only way to have good, integral and reliable true data, and it will help you and your customers win.